A devout saree connoisseur would surely have heard of – and most likely experienced – the magnificence of a heritage Patola Saree from the Indian state of Gujarat. Getting their name from the hamlet town of Patan, where lies the ancient technique of weaving these exquisite drapes, handloom Patola Sarees hold a place of pride in the list of breathtaking Indian weaves. Considered extraordinary for their finesse and design detail, Gujarati Patola Sarees are made as double ikat weave, where both warp and weft yarns are resist dyed multiple times, such that each design element gets represented beautifully. 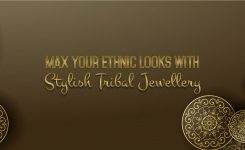 Given their amazing detailing, these have been much sought-after, as precious barter and trade items, since centuries. Valued highly by the Dutch and British, Patolas traveled the world through the spice route trade. Famed Indonesian double Ikat weave of Tenganan is also influenced by these amazing drapes. 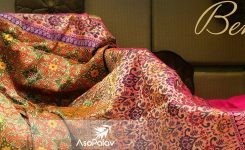 Each woven drape or yardage of Patola fabric is considered an achievement, given the complex processes involving delicate silk yarns and the marvelous results. These splendid double Ikat weaves with spectacularly vibrant colors and exquisite woven patterns are among the most prized handloom saris of India. 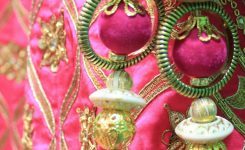 Albeit not easily available or well-understood, grand Patan Patolas are heirloom drapes – sought after by the royalty and the rich and famous. Owing to their price and rarity, authentic Patolas have faced troubling times. Thankfully, today they are on a path of revival, where their glory is reinstated. 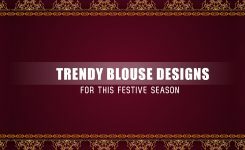 Many leading ethnic-wear brands, textiles houses and fashion designers have also done their bit, by bringing back these weaves to the well-deserved limelight, taking them, yet again to the global stage, where they are hugely admired. Woven meticulously after laborious, multiple resist dyeing (tie and dye) processes of various clusters of yarns, creation of authentic Patola Saris takes lots of effort and time, sometimes stretching to weeks and months. No wonder the ‘real’ Patolas are quite expensive! Made in a special cotton-silk blend or a rare wild silk variety, these legendary drapes are hand-dyed and hand-spun – and many are still made-to-order by the few weaver families of the region. In fact, there was a time, when Patan Patolas were only made for the royals – by specialist weavers. Patan Patola is an Ikat weave. Ikats themselves are popular patterns and weaves, and are produced by first tying and dyeing the yarns, which are then woven on looms, employing meticulous techniques. Though, there are many types of handloom ikats woven in India, each different from the other, given the variations in appearance and motifs, Patan Patolas are iconic. The double Ikat of Patan is different from the other well-known one made in Pochampally, Andhra Pradesh. However, to a discerning eye – the difference is stark. The diamond shaped and geometric patterns, characteristic of Ikat weave are present in Patan Patolas too, but they have characteristically brighter colors and sharper, clearer, discernible motifs – often in splendid detail. These sarees are unmatched in the brightness of their colors and depth of colors – and are highly tenacious and long-lasting. While many of these ikat saris are made with small design motifs of animals, peacocks, birds, flowers, vines, wedding scenes repeating themselves in set patterns, the more expensive and complex Patola weaves, sometimes, have no repetition in motifs – with the entire drape representing a complete scene/ landscape. Patolas are so important in the scheme of handloom weaves that they are now a misused misnomer. Many people tend to (wrongly) use the term Patola to describe any sort of Ikat pattern, they come across. 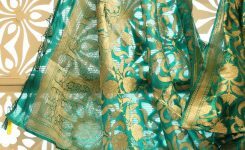 Not only the similar motifs of Pochampally sarees, but also those of other Ikats are often called as Patola – in the common parlance. Sambhalpuri Ikats from Orissa and Double Ikats of Pochampally are other beautiful handloom ikat weaves, but they certainly are different from Patolas. 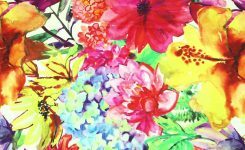 Likewise, there is a stark difference between Rajkot Patola – the popular and relatively low priced version of ikat silk sarees made in Gujarat – and the heritage Patola. Naturally, much like anything so precious and aspirational, Patan Patolas have many alternatives and imitations. Sometimes, even the cheap imitations, or prints imitating the weave’s characteristic designs are sold on the pretext of them being ‘a Patola’. There have been many legends and anecdotes surrounding the heritage Gujarati sarees of Patola. In ancient times, these textiles were considered to have medicinal or healing properties. Important things and money were kept wrapped by some in Patola weave fabric pieces or handkerchiefs – as the fabric was known to ward off evil influences. Also considered auspicious, Patola made a popular gift within families and during weddings (for brides). It was also believed to be the fabric of Gods, and hence was used to embellish idols in temples. Durga or Goddess idols were draped in them, during popular festivals like Navratri. Today, Patola Saris are non-negotiable for every true-blue sari lover. 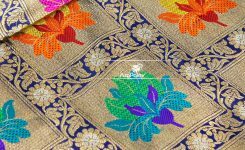 Every Gujarati bride dreams to own or inherit one of these grand drapes, while every doting mother from Gujarat hopes to be able to gift a glorious Patola to her daughter or daughter-in-law. 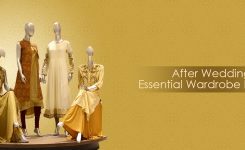 Ostentation-free Patolas have a contemporary appeal and are easy to wear and style for all kinds of modish looks.